Being an excellent Manufacturer, Exporter & Supplier, we strive to live up to our reputation. With our expertise in the industry, we are engaged in offering the best range of Semi Automatic Pneumatic Lug Capping Machine. It is cherished for its high performance. Its excellence is tallied to the quality as required by industrial standards. We make it available in protective packaging to deliver it safe for a long time. Get in touch to avail it at pocket friendly price. 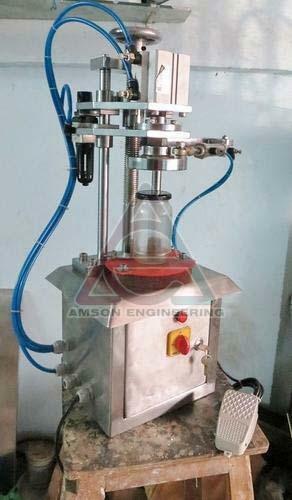 LUG Capping Machine from AMSON Engineering is a very successful machine, with complete Pneumatic working. This machine is widely used in food industries where LUG caps or Twist Caps are used for sealing JAM, Pickles, Honey or other food items. Also used in Herbal/ Ayurvedic industries to pack Chyavanprash. This machine is very compact, table top design with inbuilt panel box at the bottom of unit. Machine is very easy to operate with a pedal operating switch. The machine can seal small caps to bigger caps in the series. Pneumatic operation gives flexibility in operation. Glass bottles with height from 30mm to 200mm can be managed by this model. After a long time research and development, we have designed such a machine which can cap any sized LUG caps to Glass bottles. The machine is called, Pneumatic LUG Capping Machine model Number AEPLC80. Air Consumption: 2 Cfm, @ 5.5 Bar. Number of Cylinders: 2 Nos. Power Consumption: 230vac, 50 Hz, 0.5 Kwh. Machine Size: 15” X 18” X 25” H.
Machine Weight : 45 Kgs. Gross Weight : 65 Kgs. Inbuilt Panel Box Provided with Timers and Solenoid Valves. Bottle and Caps Placed Manually. Electrical Pedal Switch Provided for Operating. Strong Design Requires No Maintenance. Cap Tightening Height Adjustable By Hand Wheel. Bottle Bottom Gripping Surface Provided. Automatic Models also Available On Request.